Valli grew up in suburban New York and started sewing clothing when she was ten. 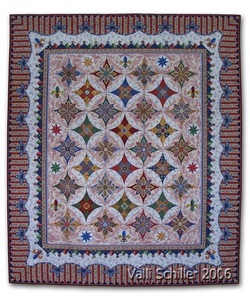 Although her mother quilted, Valli didn’t attempt quilting until she and her husband moved to Colorado. There she found a quilt guild in the town of Wheat Ridge, a hotbed of machine quilting, influenced by local quilters like Harriet Hargrave. At first she thought of herself as only a quilt appreciator. 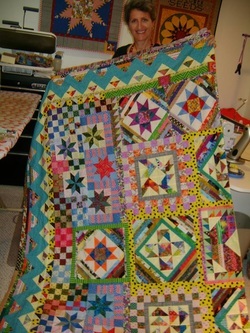 But she loved the group’s energy and support so much that she soon started making her own quilts. After eighteen years in Colorado, and a shorter stay in Texas, her family ended up in Naperville. Valli sought out Riverwalk Quilters Guild as soon as they arrived in town and since then has served as treasurer and programs chair. When asked which quilters she admires, she quickly mentions two – Debra Wagner, for innovative machine techniques, and Judy Martin, for pieced quilt designs. 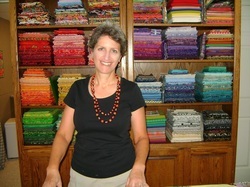 Valli has been competing in regional and national quilt shows since 2001, when her first entry won an honorable mention at the Houston International Quilt Festival. A Riverwalk Guild workshop with Sharyn Craig sparked the design of Valli’s Mille Fleurs – a quilt that appeared on the cover of Quilters Newsletter Magazine in 2008. Always looking for new ideas, just now Valli likes “modern” free motion quilting, using straight lines, ruler work, and geometric patterns. She does all her own quilting on a domestic sewing machine.